650 pages | 540 B/W Illus. "All subjects are explained using a level of detail that suits both the experienced and the undergraduate reader. … The selection of topics is suitable for an updated book aligned to the state of the art on the subject. Quite a few new chapters have been added to the text of the previous editions and most of the original sections have been improved to include the newest techniques. … Chapter 11, in particular, has been improved, and many aspects which required further in-depth analysis have been now clarified. The book is also well provided with examples and simulations. 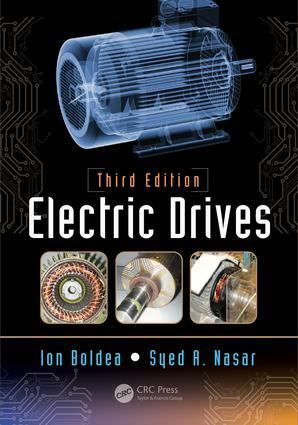 … The new edition of this successful book covers all significant subjects relevant to electrical drives. Past editions of this book constituted my favorite references for my everyday practice in the field. This updated edition promises to remain my companion for the years to come." "… quite comprehensive. … has many examples to be used in teaching. … up to date with the latest machines used for speed control. … very well done. … covers both motor and generator operation, which is a stronghold. It also has MATLAB® simulation files, so students can try to simulate quite easily. … good for a course on electrical machines and their control." "I strongly recommend this well-balanced modern textbook as a basic text for a wide audience of engineering educators, students, and engineers in industry. I have no doubt that Electric Drives is the best textbook from the area of electric drives technology on the market, and it will certainly be at least as successful as the first and second editions." Ion Boldea is professor emeritus of electrical engineering at the University Politehnica Timisoara, Romania. A life fellow of the Institute of Electrical and Electronics Engineers (IEEE), Professor Boldea has worked, published, lectured, and consulted extensively on rotary and linear electric machines, drives, and maglevs for more than 40 years. He has received many accolades, including the IEEE Nikola Tesla Award (2015). Syed A. Nasar (deceased) was James R. Boyd professor emeritus of electrical engineering at the University of Kentucky, Lexington, USA. A life fellow of the Institute of Electrical and Electronics Engineers (IEEE), Professor Nasar received the IEEE Nikola Tesla Award (2000), among other accolades. His research efforts were focused on electric motors.